Guests of honor who awarded the diplomas including me from Leyendo and Suzanne Filsinger from KKIS Project. 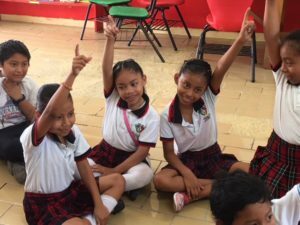 Many students don’t continue their education after elementary school in Mexico. Work permits are allowed at age 12 and families need their income. Consequently there are two elementary schools with morning and afternoon sessions in this neighborhood, only one junior high school with just a morning session and no high school in the vicinity. 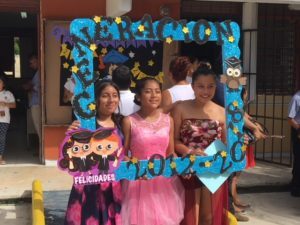 So the end of the school year means Sixth Grade graduation ceremonies and parties. 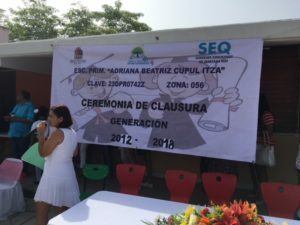 Last week I was invited to help award diplomas at two primary schools where Leyendo has built libraries. It has gotten hot and humid here but we were provided with little bits of shade. 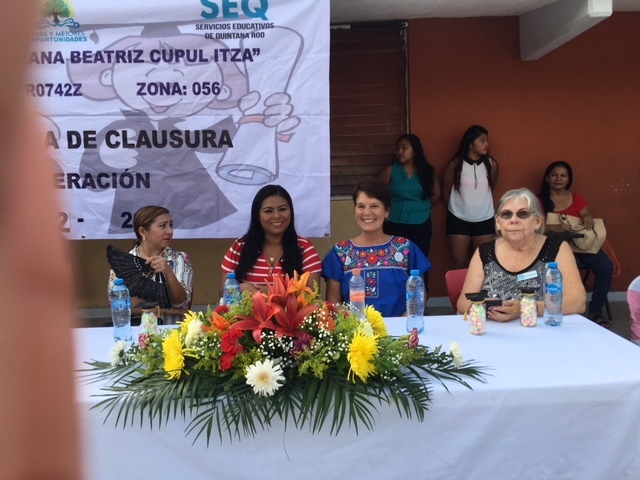 At the beginning of the Adrian Cupul Itza Primaria ceremony we were treated to a dance performance by a dance troupe in the Veracruz style which included several of the graduates. 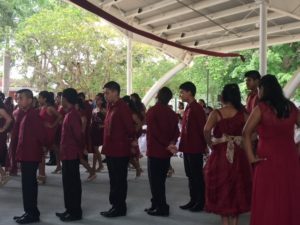 The tradition is that the graduating class choreographs and performs a dance at the ceremony, they receive their diplomas and then there is formal dance for students with their godparents. And lots of photos of course. Adriana Cupul girls all dressed up. 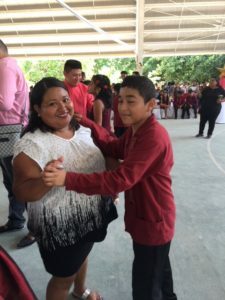 Godmother dance at Rudolfo Menendez. 6th Grade girls reading chapter books. 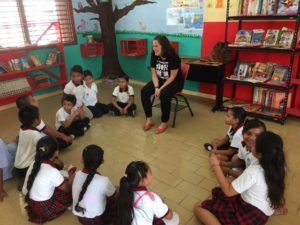 Weekly trips to the two Leyendo elementary school libraries for story reading has been a huge success. 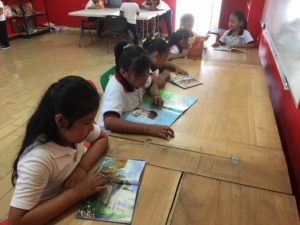 The Spanish speaking volunteer reads a selection from the library to one class of students, involves them in answering comprehension questions and then usually gives time to explore the library books. Lucille explains library rules to Class 3 A. 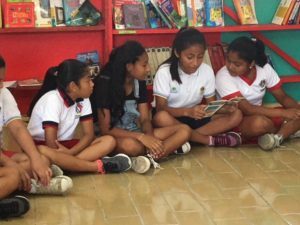 Alma reads a Mayan legend to 4th Graders. Next week is the last week of school until mid-August so this was our final week with the kids. 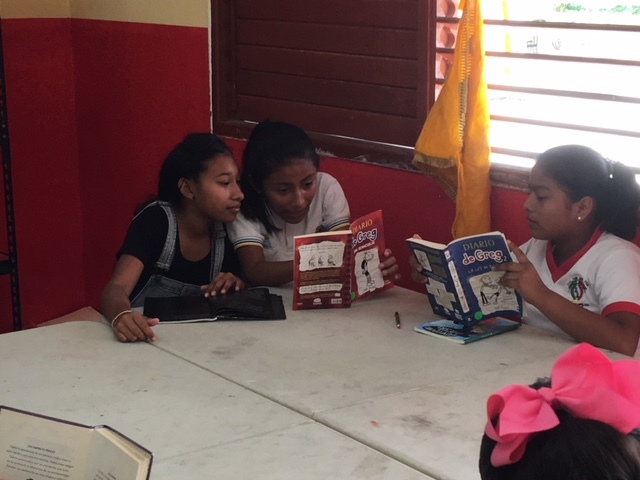 We are hoping to make these lending libraries for at least 5th & 6th Grades next year as the students are frustrated by not having enough time with books they want to read. I did hear from one 3rd Grade teacher that they are spending time in the library, he told me Wednesday was his day. 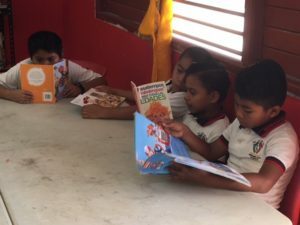 This is very good to hear as we want the books to be read and loved. 6th Graders read a story aloud.